The plan was for Ryan to vacuum while I gave Zack a bath. 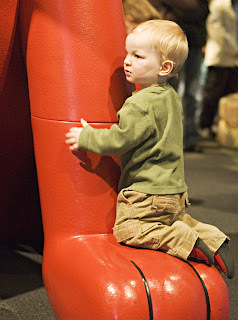 Zack decided the men needed to stick together, so he grabbed his vacuum and helped his dad. 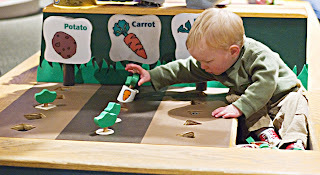 Saturday, Zack and I went to The Children's Museum in Indy with my sister and her kids. I didn't get many pictures because the adults were out-numbered by the kids and always going in opposite directions. 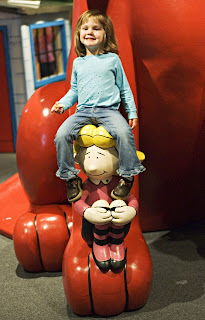 Here is Courtney and Emily hanging out on Clifford. 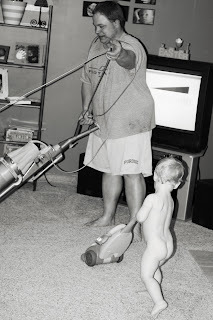 Naked vacuuming...now that should be a new sport! TOO FUNNY! I think there's a new trend going on here: men/boys vacuuming. My hubby (John) and Cameron love doing that as well - although they haven't tried it without any clothes on ;-)! We've definitely come a long way from the 1950's!